Find out how organizations are incentivizing leaders to guide their organizations in new directions to meet evolving demands. Despite tumultuous changes in the industry, executive compensation in healthcare has remained fairly stable; but there is an increasing need for pay structures to evolve to meet changing policies and priorities. This report shows how fondness for the status quo in executive compensation, especially when it comes to incentives, can lead to unfortunate mismatches between how executives understand their goals and how organizations need to move forward with reform-related activities. 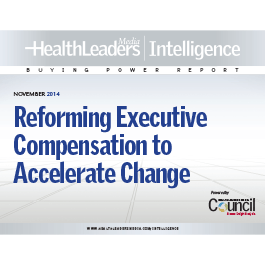 What are the top areas where healthcare leaders are investing their dollars in the near future to realign executive compensation? How are the two main ways executive performance metrics are changing? Which key clinical performance parameters will matter more over the next three years? Why has Enloe Medical Center cut out all individual performance goals from executive compensation in favor of team goals, and what is the main thing it had to get right to make them work? What special role must CEOs play in guiding both boards and executive teams to establish and accept compensation structures appropriate for new industry priorities? How are a proactive minority of leading organizations already modifying executive compensation structures to accommodate value-based purchasing?